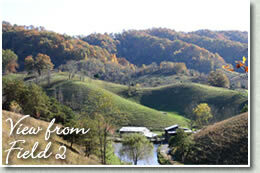 We raise hair sheep and Tennessee Fainting Goats on Clinch Mountain in Northeast Tennessee. Our stock are guarded by eight livestock guardian dogs: Zeus and Xena, the Great Pyrenees, Annie, Maggie, Khan and Ike, Anatolian Shepherd Dogs and Karakachans, Sofia and Milos. Three border collies, Pix, Cap and Deal, help out with the daily chores. Barn cats Calico, Fluffy, Minute, Dot and Moxie keep the mice at bay and an assortment of chickens, guinea fowl and ducks keep the place from getting too quiet or too clean. Mountain in Northeast Tennessee. It is named both for the many springs on the property and for the cedar junipers which tend to spring up just when you think you've cleared the last of them. 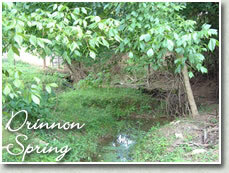 The springs provide all of our water, water so pure that no filtration is needed. 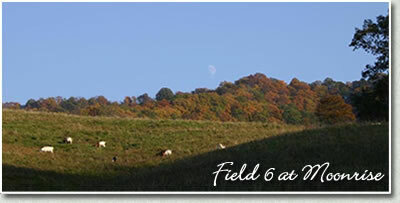 Over 300 acres of woodland and pasture offer a variety of forage and pasture for our herd of Tennessee Fainting Goats and our flock of hair sheep. Our stock is mostly pasture fed. Pregnant and nursing does and ewes and market wethers are fed specially milled grain mixes. We put up Orchard Grass, Timothy and Clover hay as a winter supplement. Beneath the farm and the surrounding countryside lies some of the oldest rock in the United States. The red Juniata Formation, visible beneath a steep cliff at the southwest boundary of the farm, originated about 500 million years ago, when what would become North America was lying with it's east cost pointing south, well below the equator, covered by shallow seas. Ninety million years later, when the overlying Clinch sandstone was formed, the continent had turned counter clockwise about 45 degrees and was moving northward, much of it now above the equator. Fossils from these early times litter the landscape. Fast forward a few hundred million years and the farm was a part of the Cherokee Nation. When northeast Tennessee was at the edge of the American frontier and still part of North Carolina, Cedar Springs was part of the old Greene farm. 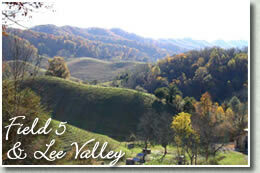 The Greene farm was known for its orchards which produced cider and wine in addition to fruit. Some of the descendents of the Greene apple trees can still be seen dotting the edges of the woods. As the area became settled, the Greene property was subdivided. In the 1900's the part which is now Cedar Springs Farm was bought by the Drinnon family who raised corn and livestock on the steep hills and tobacco on the bottoms. The Drinnon homestead was later divided into three farms each owned by a Drinnon descendent. 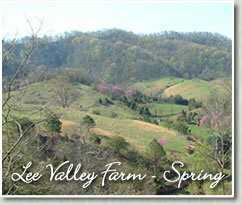 These farms were eventually sold outside the family and became Lee Valley Farm Deer Run Farm, and Macaw Hills Farm. 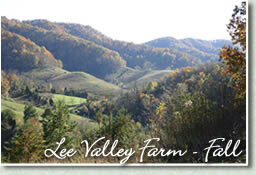 From the 1970's to the 1990's, Lee Valley Farm was a popular dude ranch. A Drinnon farmhouse became the dining hall and party room. A chicken house was converted into a guest cabin and several other cabins were added. 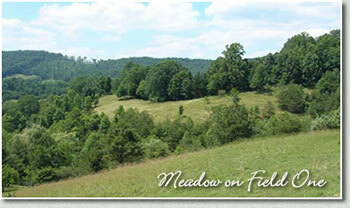 Deer Run Farm was bought by horse trainer, Irv Nickerson. 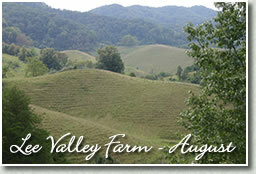 Macaw Hill Farms, named for the big red Macaw of artist Steve Clippinger, began as a summer retreat from the Florida heat. Steve converted an old Drinnon barn into a studio and an apartment, where he stayed until his house was finished. Steve's house was built near the site of another old Drinnon farmhouse which had burned down. 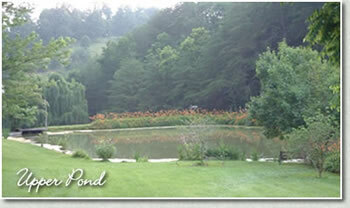 The original Drinnon farmstead was reassembled by Bill and Sophie in 2001 and named Cedar Springs Farm. This spring has an interesting story associated with it. One day long ago a man was working near the spring when his brother rode up and asked if he could water his horse. He was told that he was welcome to but to take care not to muddy the water. Heedless, the brother rode his horse into the spring, ruining not only the water but the jars of food and milk set out to cool. Seeing this, offended brother ran to his cabin, got his shotgun and shot his brother dead. Thus began another of the legendary Tennessee family feuds.